We’d love your help. 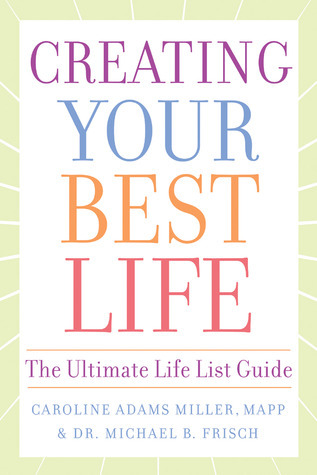 Let us know what’s wrong with this preview of Creating Your Best Life by Caroline Adams Miller. The passion for life lists has spawned an industry that includes thoughtful experts such as Caroline Miller, a life coach and motivational book author, and Dr. Michael Frisch, a positive psychology coach and clinical psychologist at Baylor University. Working together, they have fashioned the most useful, science-based, and up-to-date book on the topic of goal setting and The passion for life lists has spawned an industry that includes thoughtful experts such as Caroline Miller, a life coach and motivational book author, and Dr. Michael Frisch, a positive psychology coach and clinical psychologist at Baylor University. Working together, they have fashioned the most useful, science-based, and up-to-date book on the topic of goal setting and accomplishment. Creating Your Best Life supplies dozens of interactive exercises and quizzes readers can use to identify their most cherished needs, ambitions, and wishes. The exercises are fun, making the process of self-discovery enjoyable and productive. The authors unique life list coaching program organizes life lists into 16 key areas that are universally known to make people happy to help you actually achieve your aspirations. No other life list book offers research-validated information on why certain steps matter in goal accomplishment, or even how goals are connected with any type of life satisfaction. To ask other readers questions about Creating Your Best Life, please sign up. I have been on a positive psychology kick lately, but I feel like I am entering that stage of diminishing returns. It might be time to lay off the self help books for me. The ironic thing is how addictive self improvement can be in the planning stages. It's energizing to get a book about creating your best life or buying that program that will give you a six pack, but the possession of such books or programs does nothing to achieving those goals unless you actually take the time to apply them. T I have been on a positive psychology kick lately, but I feel like I am entering that stage of diminishing returns. It might be time to lay off the self help books for me. The ironic thing is how addictive self improvement can be in the planning stages. It's energizing to get a book about creating your best life or buying that program that will give you a six pack, but the possession of such books or programs does nothing to achieving those goals unless you actually take the time to apply them. The application part is the dirty work. This is a good book for people who are natural list makers and planners. It's well organized and follows a logical progression. The part I learned most about was the chapter on primes, so this was a helpful book for me. It might be less inspirational than many other books and may actually encourage a prolonged planning state in people who are prone to that, but it has compiled much relevant research for those that need that foundation. Creating Your Best Life is the only research-based book on the topic of goals and happiness, and it has found receptive audiences worldwide. Filled with interactive exercises and quizzes, it helps readers set and accomplish life list goals and understand the link between goal accomplishment and happiness, also known as Positive Psychology. In a step-by-step fashion, the book teaches readers how to coach themselves on how to set goals in 16 life domains, as well as take control of their environme Creating Your Best Life is the only research-based book on the topic of goals and happiness, and it has found receptive audiences worldwide. Filled with interactive exercises and quizzes, it helps readers set and accomplish life list goals and understand the link between goal accomplishment and happiness, also known as Positive Psychology. In a step-by-step fashion, the book teaches readers how to coach themselves on how to set goals in 16 life domains, as well as take control of their environment to maximize their chances of success. Too Christian and too American for me. I mostly skimmed it...to be fair, I was looking for something in this book that it did not contain. I hoped it might address what happens when you achieve all your goals and pat yourself on the back....what's next? People don't appear to write books or chapters in books about this. However, Google was helpful in finding articles written on this topic, so I'm good now. I wanted to like this book; I'm a huge list maker at heart, but I just couldn't get into it. I felt like the premise was very scientific and statistic based and didn't offer me any personal connection or motivation to work on my own life. Not worth the time to read. I find that there's a certain way to read self help books - skimming, and with a great big grain of salt. And this book is no exception. Like so many of the genre, Creating Your Best Life throws out many facts to sell itself as The Answer, but without a whole lot of backing. So in between some interesting life advice, we get a section on how millenials lack self-control. But, in the middle of that, there is some interesting advice. I would have apprecated a little more hand holding in writing goa I find that there's a certain way to read self help books - skimming, and with a great big grain of salt. And this book is no exception. But, in the middle of that, there is some interesting advice. I would have apprecated a little more hand holding in writing goals that aren't about travel or sports. Started a little naf but the second half of the book is so much better. There are some really valuable, practical systems and tools for any individual or coach who wants to fool-proof their goal setting and accomplishment tactics. Well worth a read of you can gloss over the occasional wishy washy happiness spiel. I picked up this book as a recommendation from and follow-up to Martin Seligman’s book, Flourish. Creating Your Best Life takes research from positive psychology and makes it readable and applicable. There are great worksheets in the back to encourage self-exploration and goal-setting. Excellent book on "planning" your life! I really like this author & look forward to more books from her. A lot of hard work went into this book by both authors. This is a great book! The authors do a good job of summarizing lots of research, making it digestable in bullet points, and providing ways you can apply the research findings. They draw a lot on the burgeoning positive psychology field. A quick read and enjoyable, although I lagged a bit on it because I was trying to do the exercises and fill in the worksheets they provide (a big plus!). One of the most helpful exercises for me was the Happiness House exercise, where you identify the areas of li This is a great book! The authors do a good job of summarizing lots of research, making it digestable in bullet points, and providing ways you can apply the research findings. They draw a lot on the burgeoning positive psychology field. A quick read and enjoyable, although I lagged a bit on it because I was trying to do the exercises and fill in the worksheets they provide (a big plus!). One of the most helpful exercises for me was the Happiness House exercise, where you identify the areas of life that are most important to you (e.g., family, spirituality, money, community, etc. ), and make goals in those areas. The argument is that accomplishing goals in the areas that are most important to you will yield more happiness than pursuing goals in areas of less importantance. They give lots of tips to increase your success achieving goals – if-then statements, creating a community of support (the right ones – no nay-sayers! ), and more. I just wish there was maybe more discussion on how to organize all these goals, how to make time for them, how to know when to move on to the next, how to reflect upon them, etc. Reading the book has definitely helped motivate me to bring more purpose, vitality, and zest into my life, and to dream up goals I can get excited about. I have also started using this goal-minded thinking at work to focus my energies and celebrate small and large accomplishments. I'm not usually one for books like this, but I like this one. There's no attempt at magical thinking. This "self-improvement" stuff is based on actual solid Ivy League research, not pixie dust. You don't even need to create a life list to get something out of this book about developing happiness in your own life if you aren't naturally prone to such a thing, or if you've hit a particularly rough patch that you need help crawling through. It's an easy read, and actually does make you feel good. A singularly good book on the topic of seeting goals, with worksheets you can photocopy and use over and over. I checked it out of the library, yet it would be worth buying and reviewing. Exercises like the Happiness House and "Ben There, Done That" help you clarify your life's focus and the changes you need to make, one goal at a time. It also gives you the chance to create a Bucket List of things to do before you die. The best book of its kind on goal-setting. I skimmed the front sections of this book. It had some good tidbits and takeaways. I found some of the examples long and not relevant to my goals. The exercises in the back of the book are very useful for anyone looking for prompts or help brainstorming towards how to reach success achieving your goals. I thought this book was excellent! I read it slowly so that I could go through and try to respond and interact with the prompts as I read along-at least with the ones that interested me. It was slightly redundant as I read through the whole book, but all excellent information that all sparked a lot of reflection and introspection. Well done-I recommend it. This is the second time I've read this book, probably not the last. It is exactly the type of non-fiction I enjoy. Each insight is backed by scientific evidence and anecdotes then matched with suggestions for incorporating the findings into your own life to your benefit. Regardless of how good your life is, this book can offer ideas to make it better. This book has 18 chapters and 5 parts. Part 5 (pages 223-254) is just exercises and worksheets. It includes notes, resources and an index. It's more about making goals than a life list. Much of it reads like a pep talk. I think it is a good book and well written, just not quite what I was looking for. Really wonderful book for anyone interested in the science and tools needed for successful goal setting & achieving. I would give it 5 stars if it included more detail. Perhaps that would have made the book too long, as the purpose of the research is to just get you going on your goals. Overall a wonderful book. Awesome book to read at the end of the year (pure coincidence). Great goal setting information and action plans to create your best life. Highly recommended. Definitely gave me new ways to think about how I am creating what I want (or don't want)! Awesome book! It is chock full of information and scientific techniques to help you realize goals. I have been looking for a book that is based on scientific studies related to goal accomplishment rather then the more esoteric, i.e. "The Secret". Lots of great research. Lots of great stories. I guess I've read so many books on happiness and positive psychology, I didn't learn anything earth shattering. However, for a person new to this field, it's excellent. Highly recommended. Evidence-based guidelines for living life to its fullest. Anyone interested in life design would seriously benefit from this book and its many eye-opening exercises and worksheets. One of the best books I've read on goal-setting. What makes its approach different is the use of positive psychology, as necessary tools, to help one achieve one's goals. This book was fantastic! It really hits the nail on the head in terms of positive psychology and making your life more meaningful. I highly recommend it!